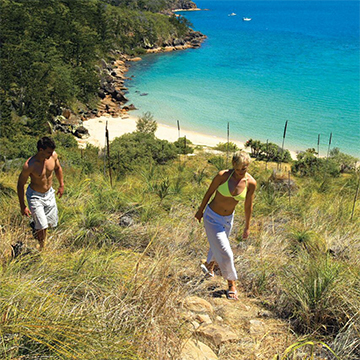 The Whitsunday Islands and coast have several bushwalking tracks for all levels of fitness. The short, gently sloped walk up to the Hill Inlet Lookout at Tongue Point, overlooking Whitehaven Beach is a favourite and not to be missed. Seasoned hikers will relish in the more challenging trails. Experience the hikes up to Whitsunday Cairn or Whitsunday Peak, or run up to the highest point on Hamilton Island for some sensational views across the islands. There are numerous walks on many of the islands. Much of the detail can be found in your on-board copy of 100 Magic Miles.